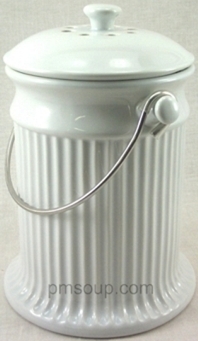 This 3 quart capacity compost pail keeps green vegetable scraps contained along with their odors! Dual charcoal filters fit neatly inside the lid and last up to 2 6 months under regular use. Replace filters sooner if necessary. The snug fitting lid has an added gasket to keep odors in and the large handle makes it easy to carry the pail to the compost bin. Two charcoal filters come installed in the lid. Three compostable disposable Bio Bags are included. Dishwasher safe with filters removed. These are greens new "BFF". For the easiest composting, try our BioBag compost pail liners, click here. They are disposable, compostable and biodegradable just like your kitchen scraps. Put the bag and contents right in your compost bin. I love this item. The quality is remarkable and it is pretty enough to have on the counter.